TD&H Engineering reconstructed 0.34 miles of Third Street in the Town of Farmington, Washington. Design services included demolition, grading, drainage facilities, aggregate and asphalt concrete surfacing, utility adjustments, pavement markings, and concrete curb, gutter, and sidewalk. We also provided topographic survey and site mapping, cost estimating, and coordination with TIB. Construction services consisted of contract administration, staking, inspection, and materials testing. 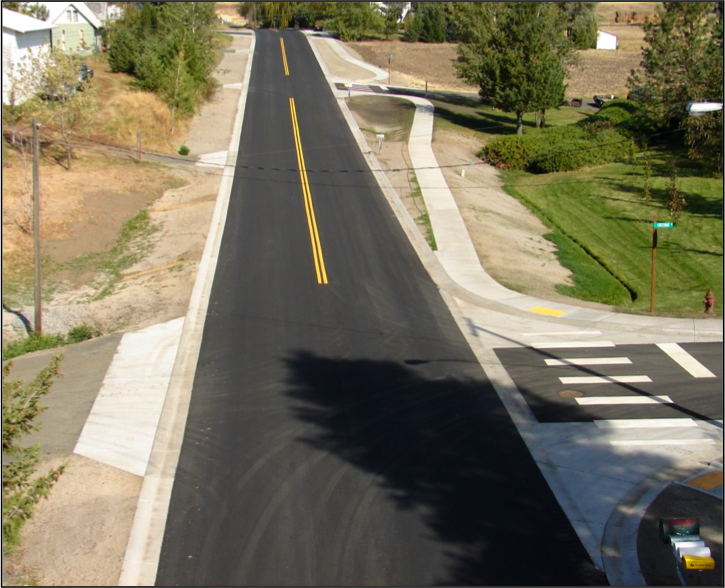 Project challenges included the lack of sidewalks or roadway shoulders near the Farmington school, substandard roadway width and pavement structure to accommodate heavy agricultural and logging traffic, and poor roadway drainage due to lack of adequate crown slope and subsurface clays. Funding of a major street improvement in a very small community is always a challenge. TD&H Engineering successfully wrote the Washington State Transportation Improvement Board (TIB) grant application to make this project a reality for the Town. TD&H Engineering worked within a fixed budget while providing excellent service.